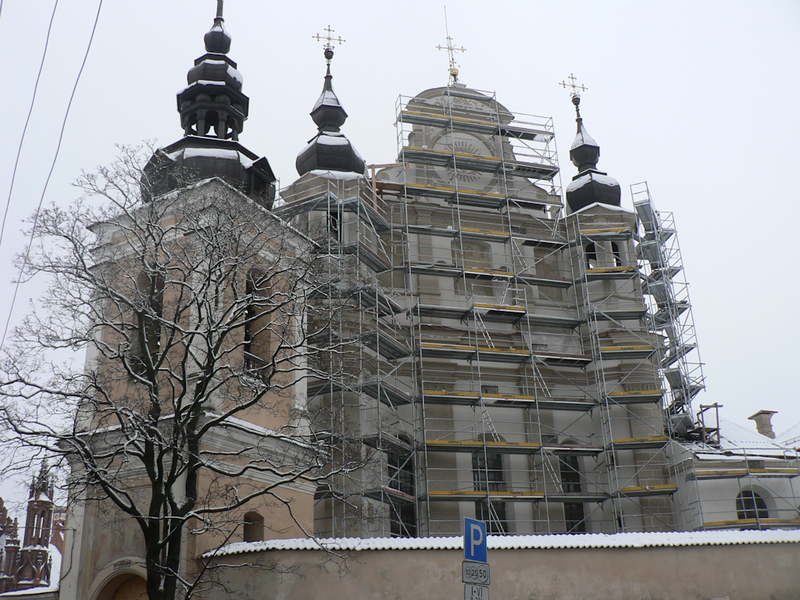 Download the free app “Bell Tower of Vilnius Cathedral”. 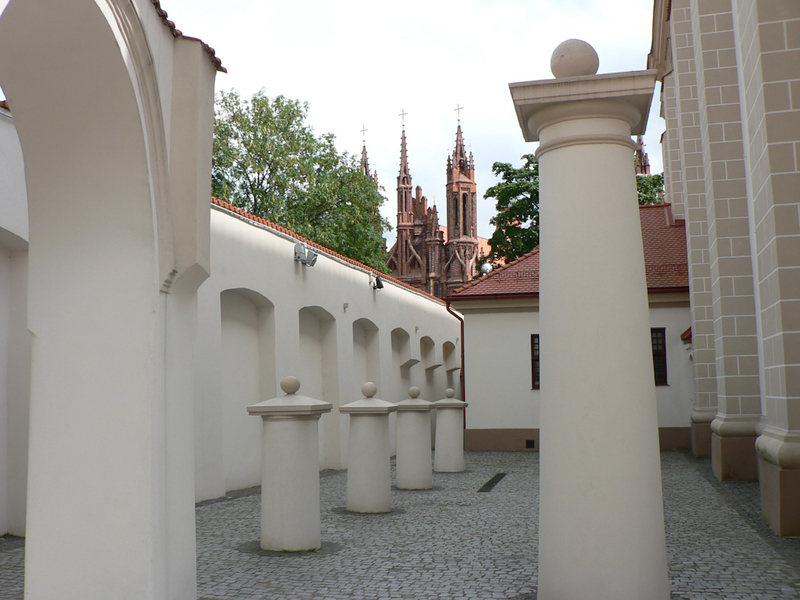 We invite you to a virtual trip to the ensemble of Saint Michael the Archangel Church and Monastery! 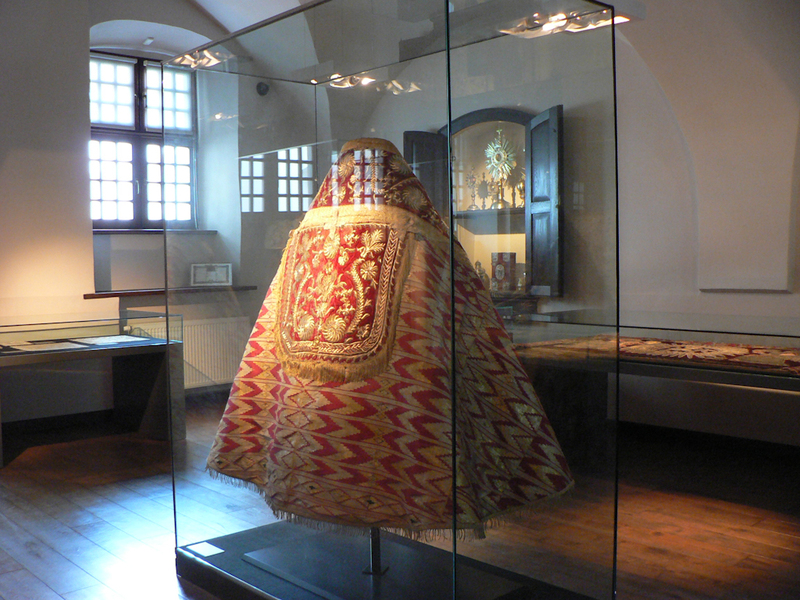 The ensemble of the Church and the Convent of St. Archangel Michael in Vilnius is noted not only for its impressive Renaissance architecture, but also for its dramatic history closely related with the famous noble family of the Grand Duchy of Lithuania, the Sapiegas. 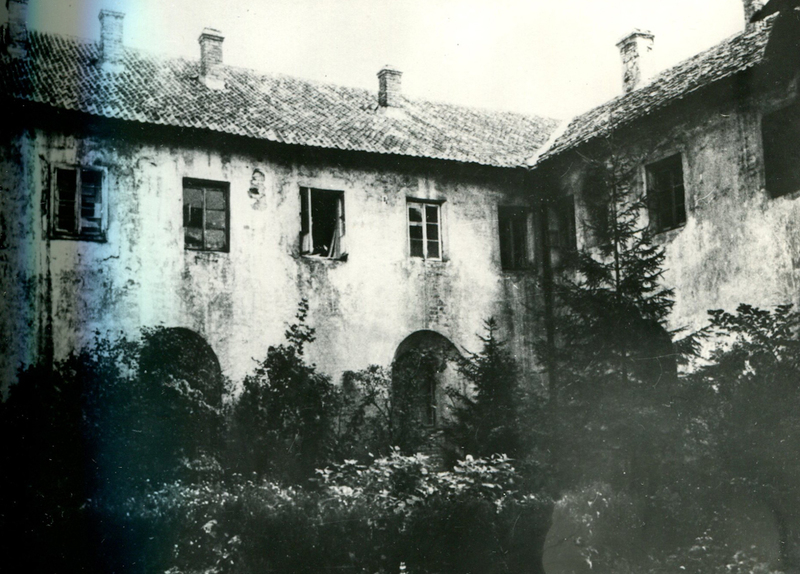 Although the history of the convent did not lack for dramatic events and restorations, the exterior of the building saw little transformation since the day it was built and its entire structure was preserved. 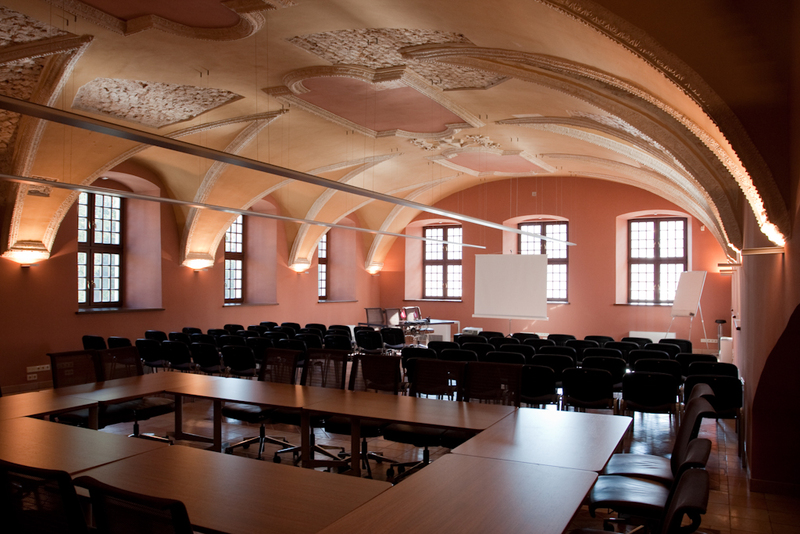 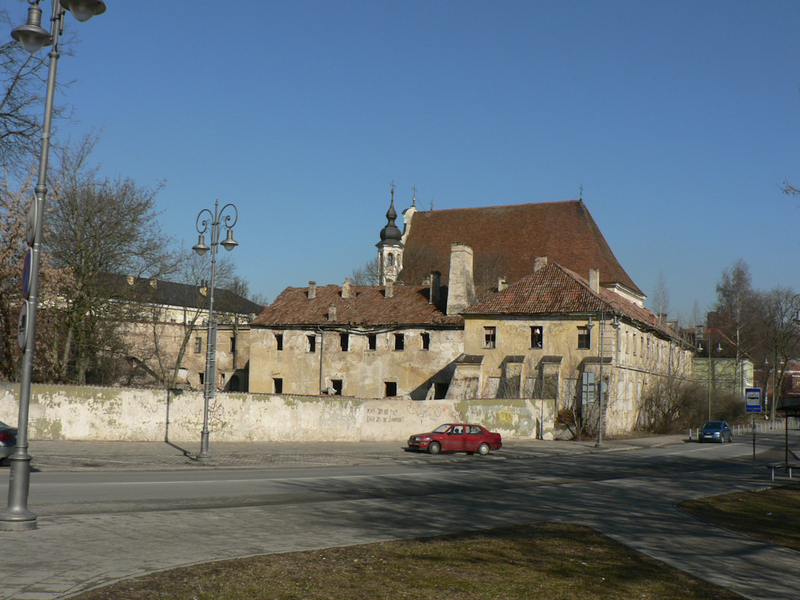 It is a rare example of Renaissance architecture in Vilnius. 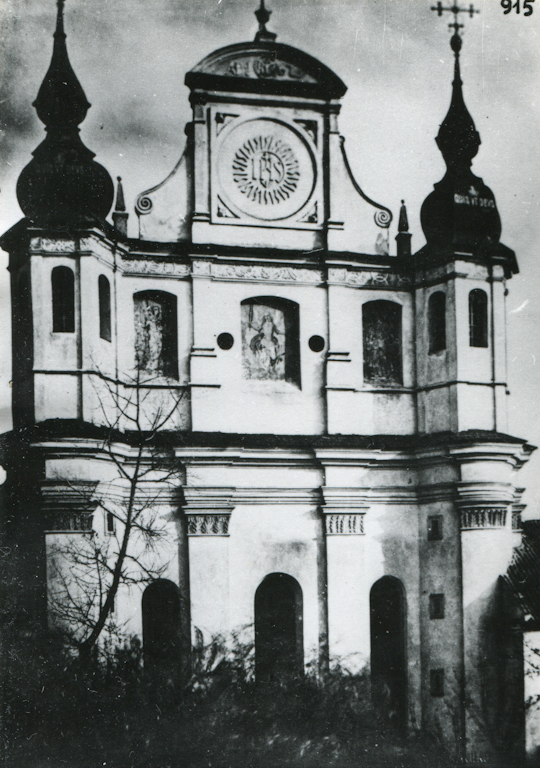 The facade of the church is dominated by the huge Christogram in a radiant glory with the building construction date above: "AD 1625". 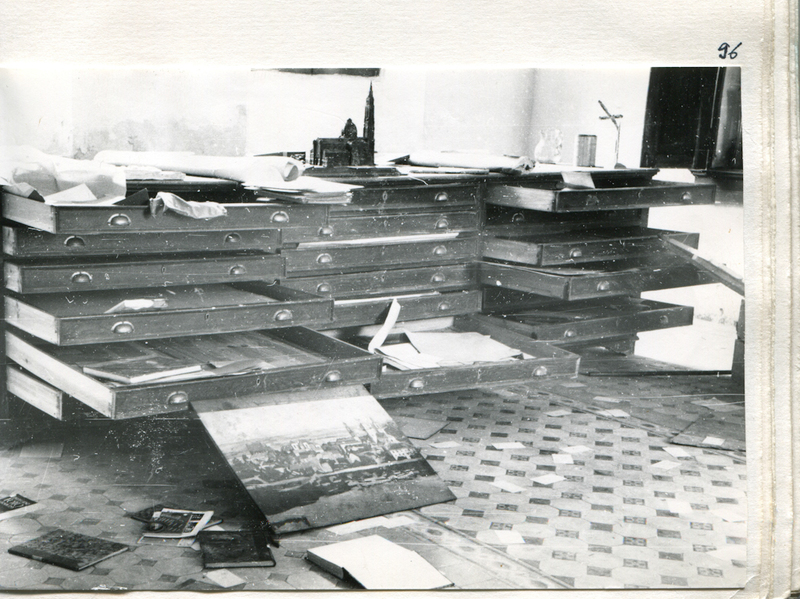 However, this date was not final. 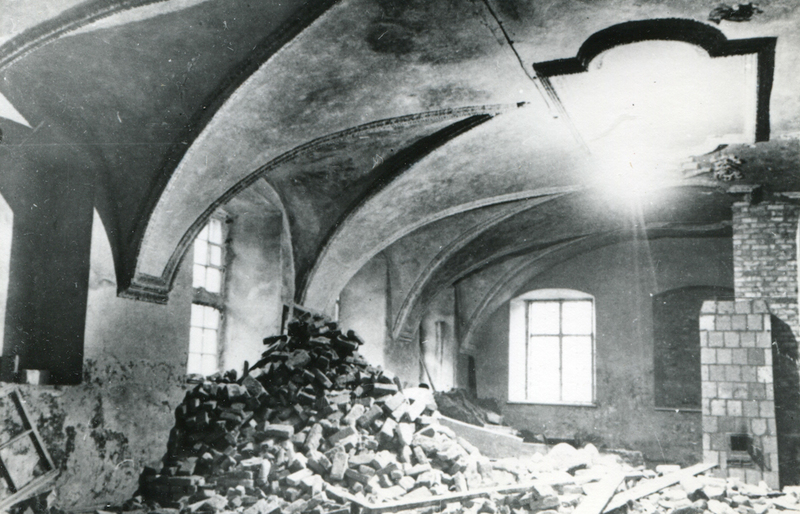 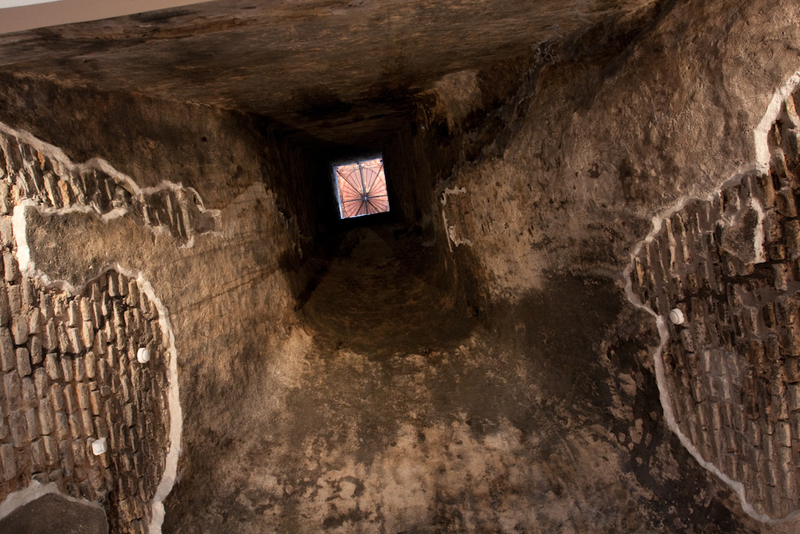 In 1627, the vaulting suddenly collapsed and had to be rebuilt. 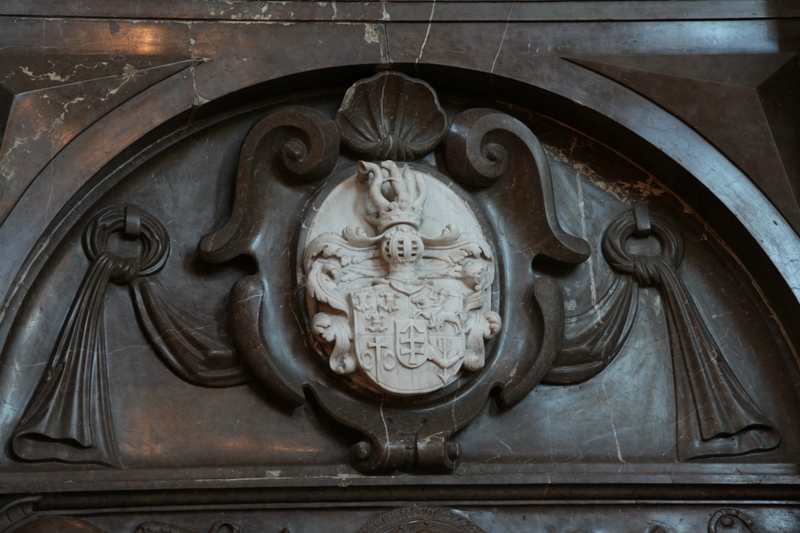 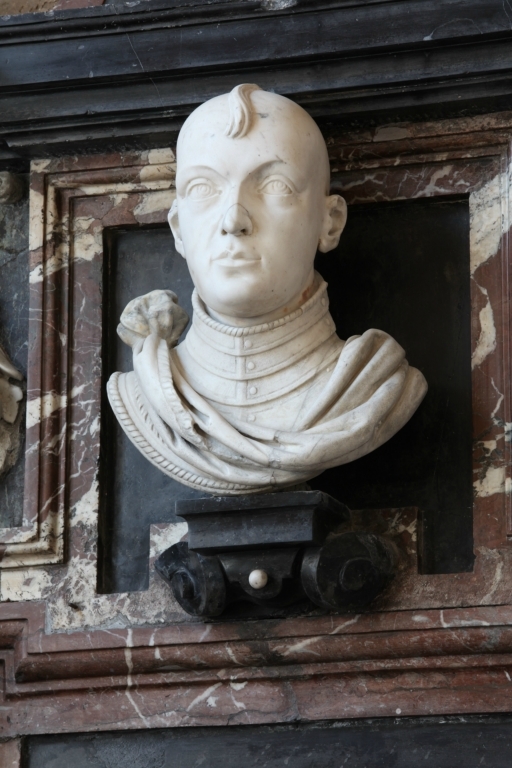 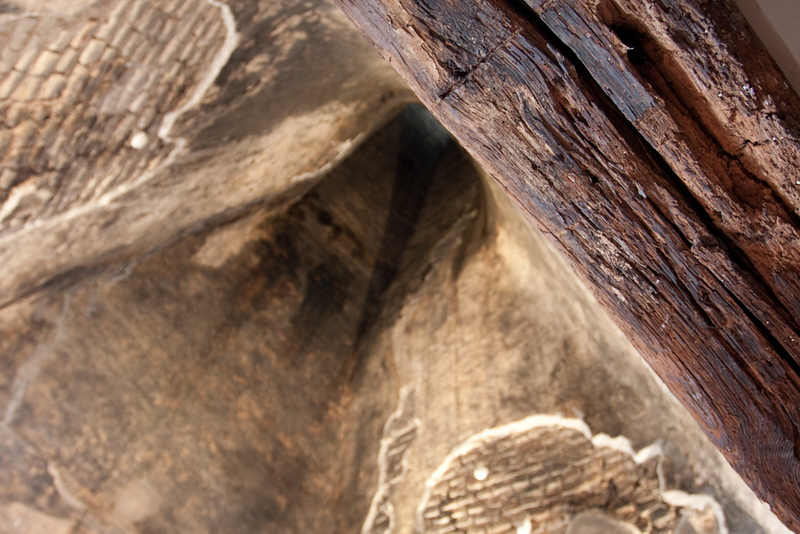 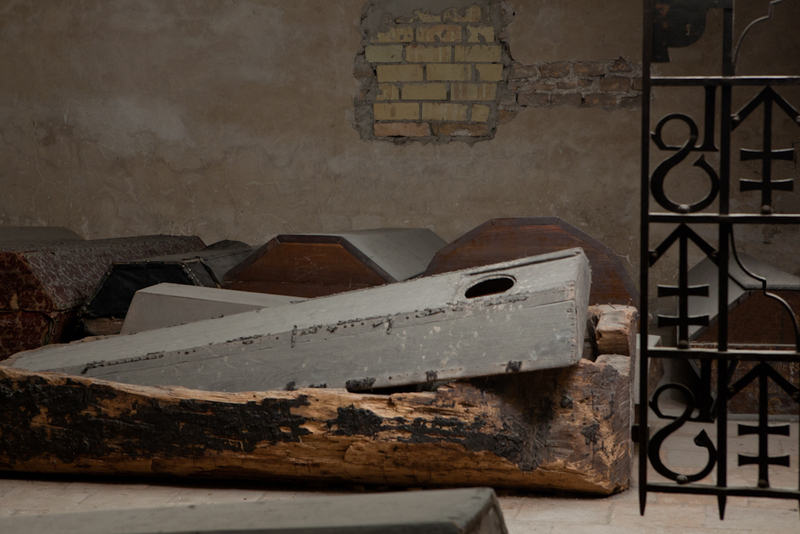 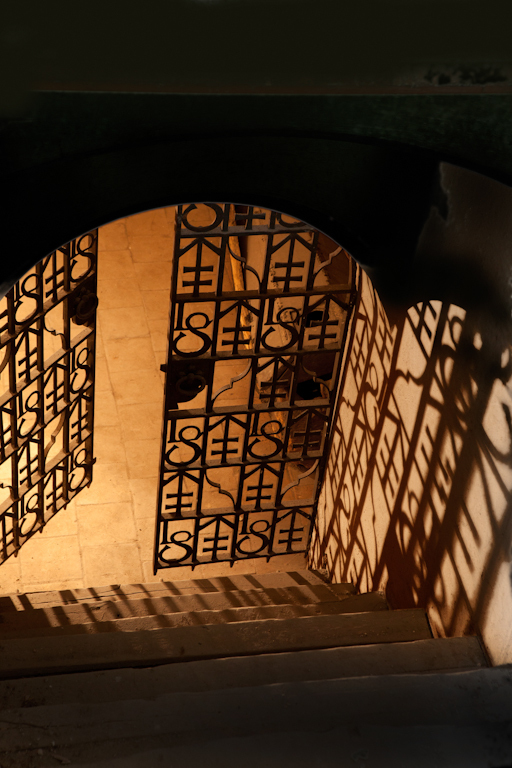 These finishing works were carried out by the mason Jonas Kajetka, who later died from plague and was buried here. 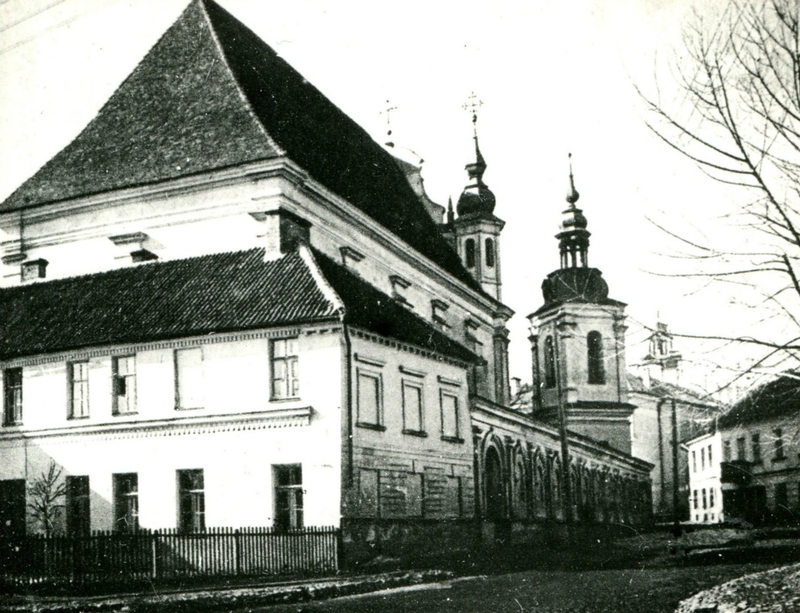 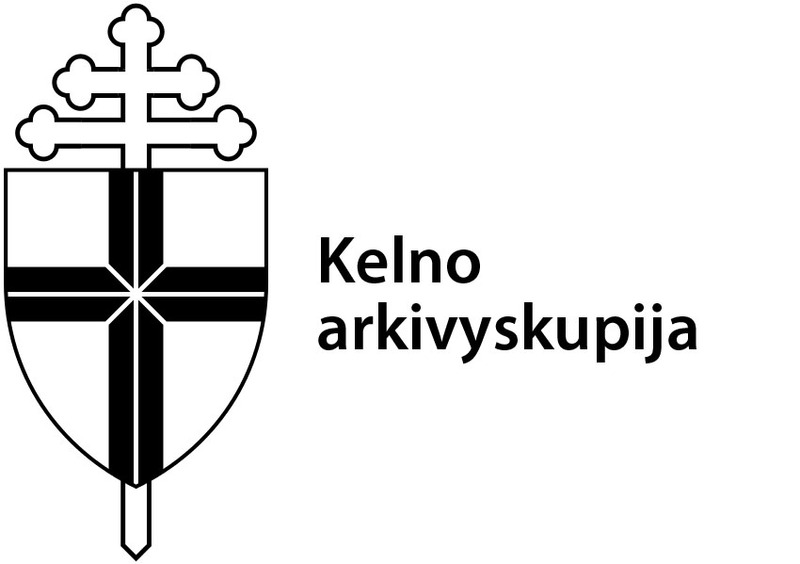 The church was consecrated on 8 September 1629 with the attendance of Bishop of Vilnius Eustachy Wollowicz. 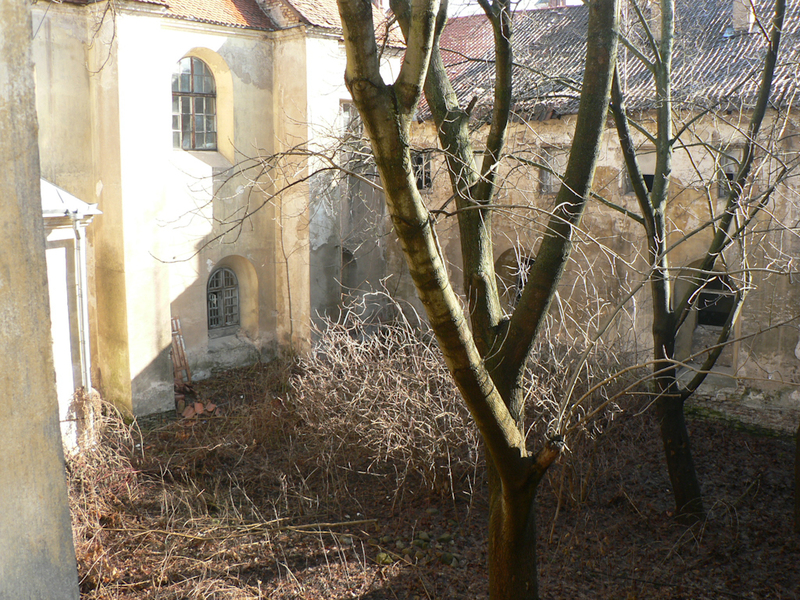 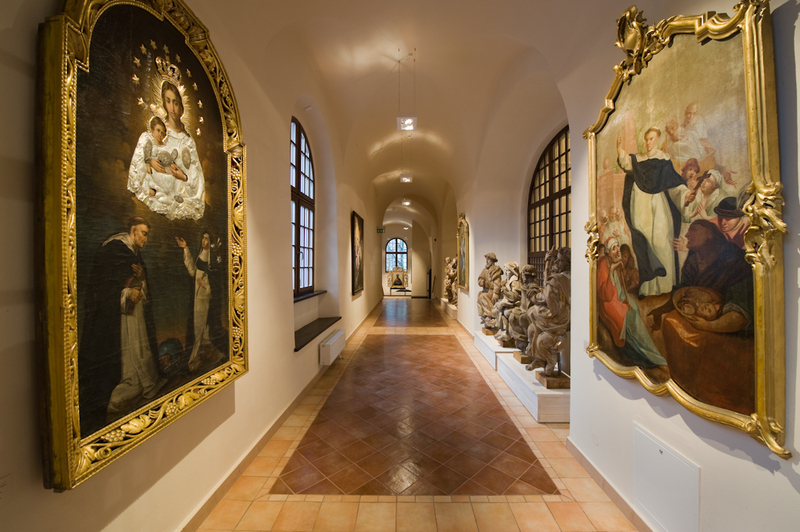 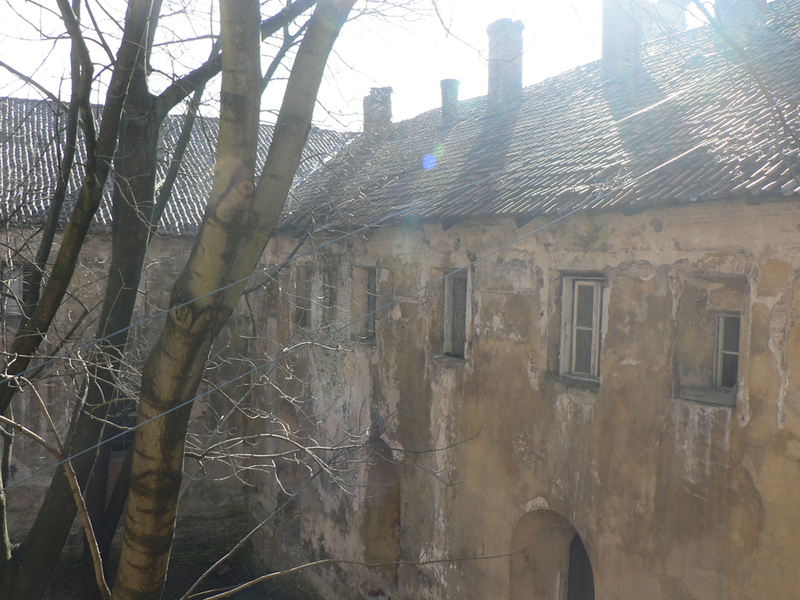 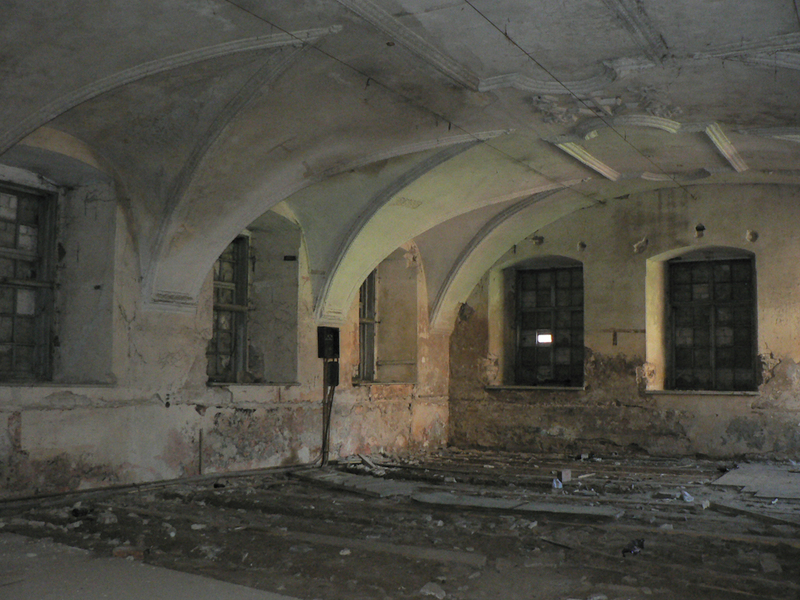 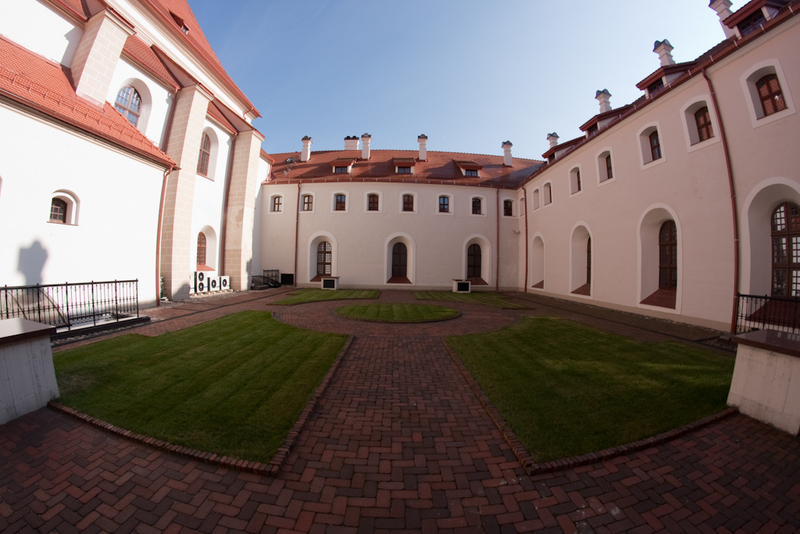 Under the initiative of the convent prioress Felicijona Chlusevičiūtė and the convent preacher Krizostomas Losovskis, a roofed procession gallery decorated with murals was built in the courtyard of the convent in 1703. 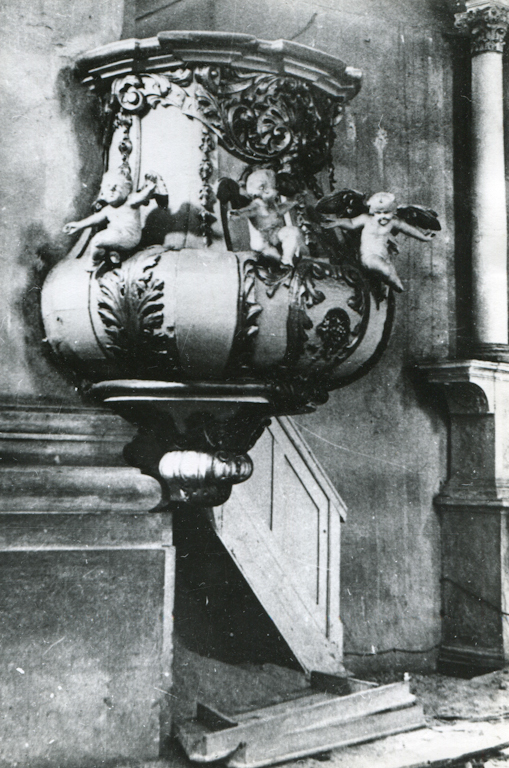 Sculptures of saints were placed on the capitals of some of the gallery columns. 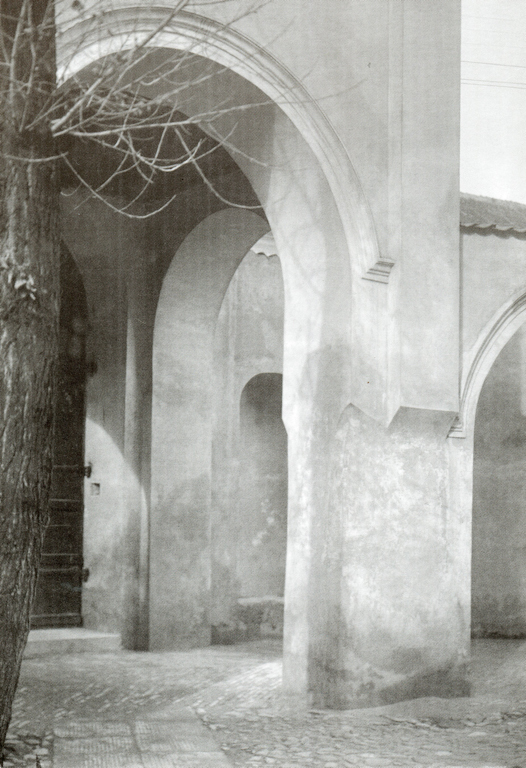 The residential premises of the convent nestling against the southern wall of the church surround the rectangular cloister, a place of resting and meditation. 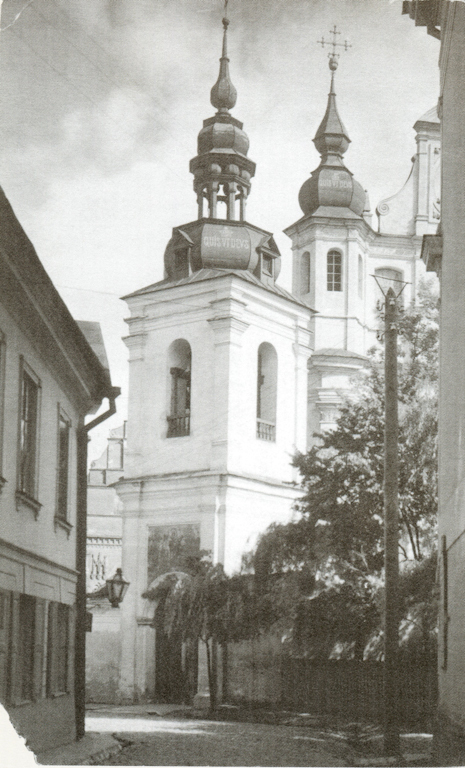 The steeple assumed its current shape in 1719-1722, when a new bell was installed with a Latin inscription saying that it was cast by Adriejus Dorlingas in 1731 when Teofilė Chlusevičiūtė was the prioress of the convent. 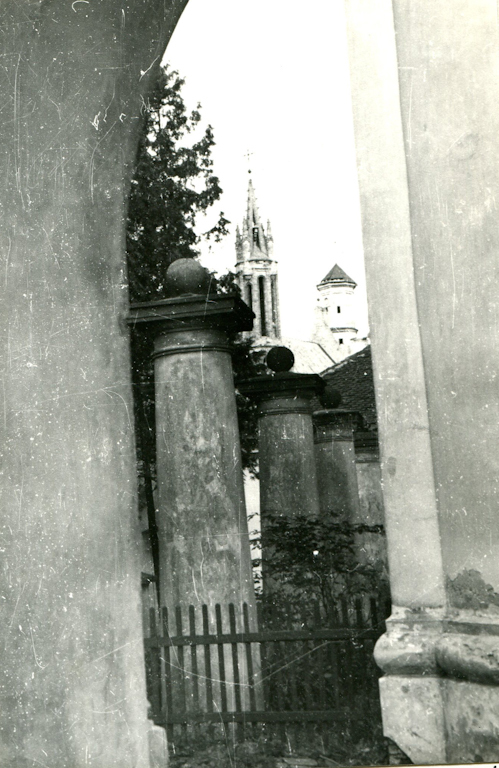 The spire of the steeple is crowned by an elegant helm similar to the Renaissance spires of the church. 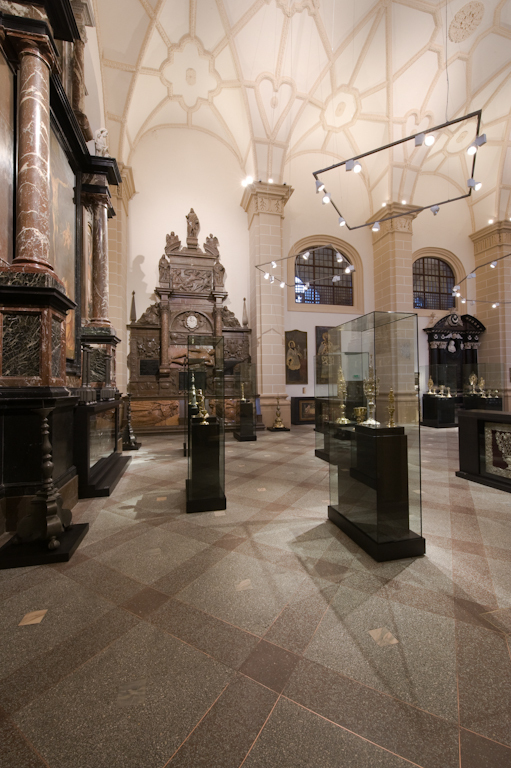 The helm is topped with a gilded weather vane in the image of Saint Michael the Archangel. 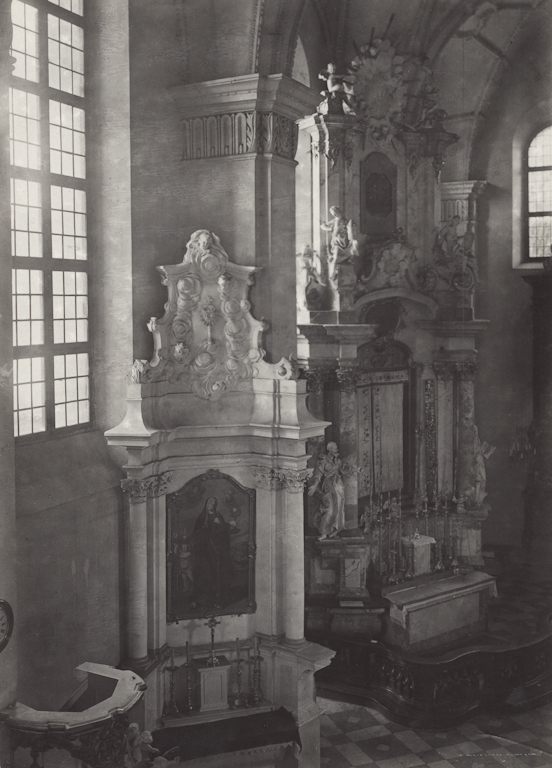 The Renaissance high altar made of coloured marble cost 25,000 auksinas that were generously provided by Leon Sapieha. 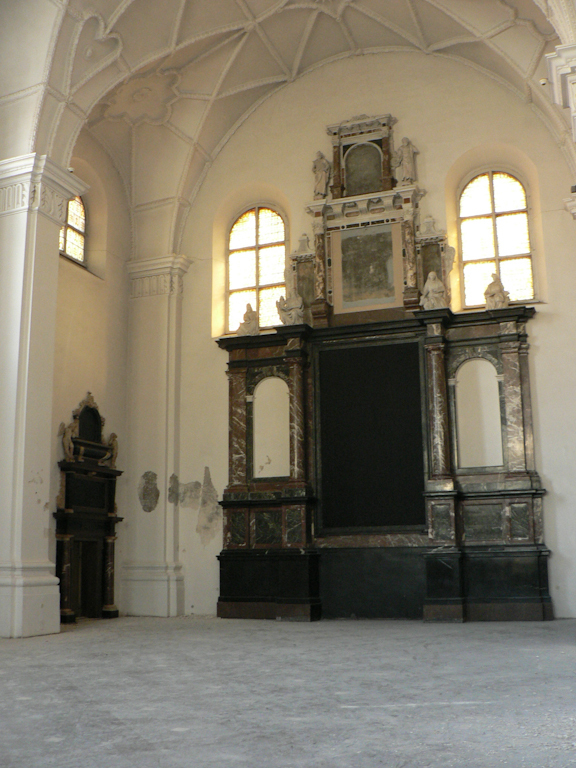 The altar was made by craftsmen of Lutheran faith which shows Sapieha's tolerance. 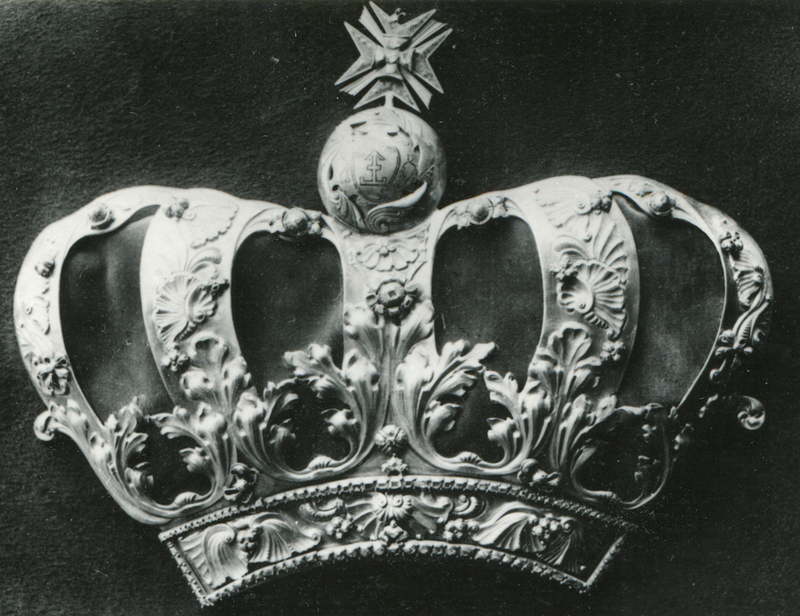 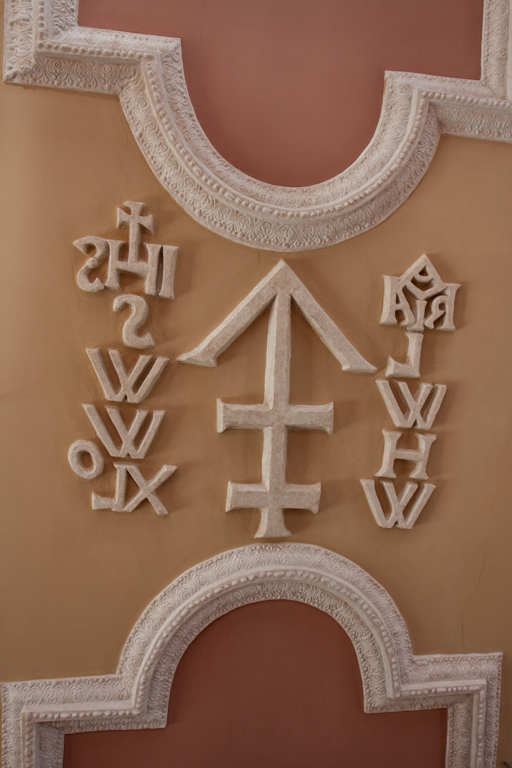 It represents ideas of the Holy Trinity and Salvation: the lower tier contains a large image of Christ on the Cross, the middle tier portrays the Father, and the upper tier shows the Holy Spirit. 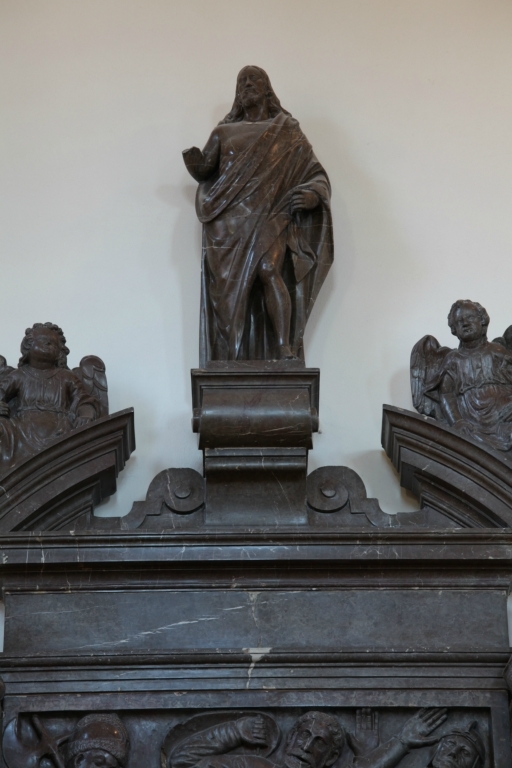 The title of the church is reminded by the images of Saint Archangels Michael and Gabriel. 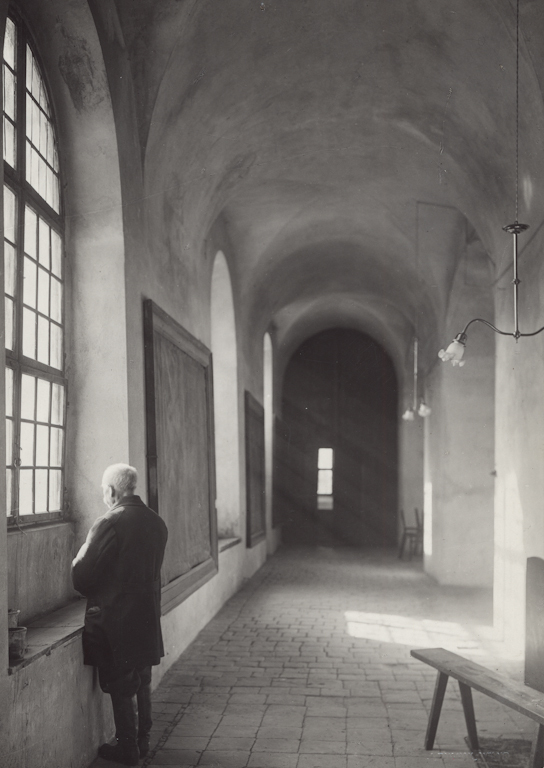 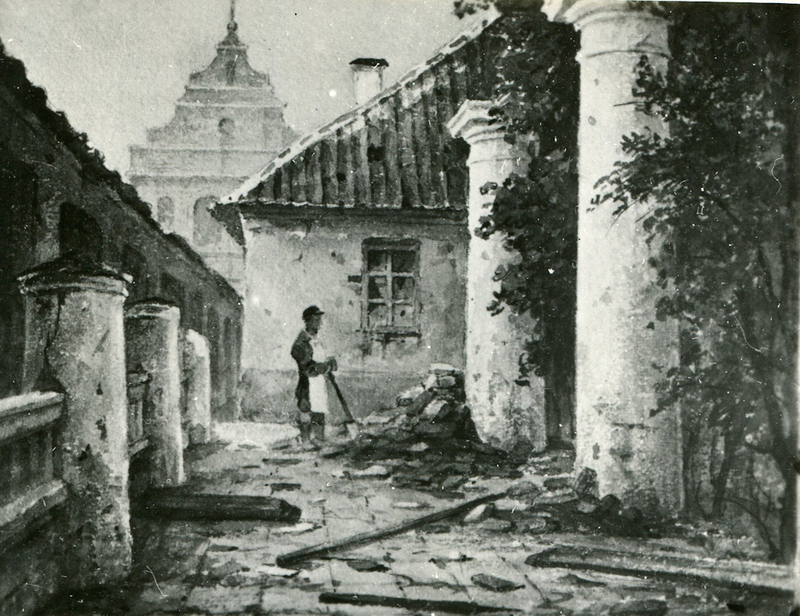 The original paintings were destroyed during the invasion of the Russian Empire. 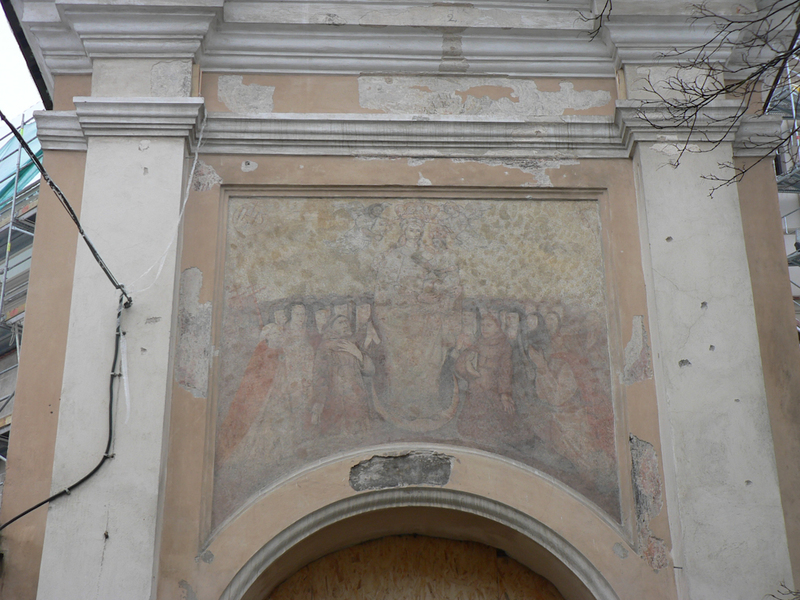 Current images were painted in the 3rd quarter of the 17th century during the restoration of the convent, which suffered heavy damage during the war. 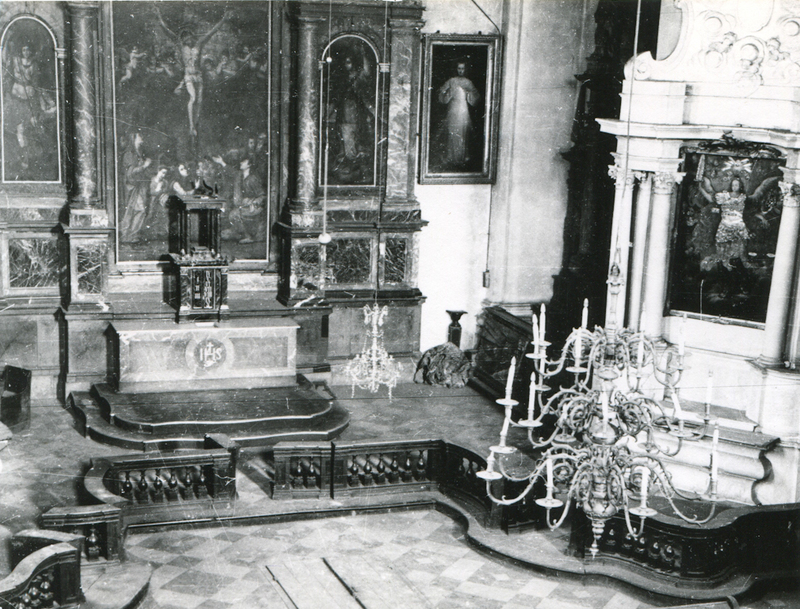 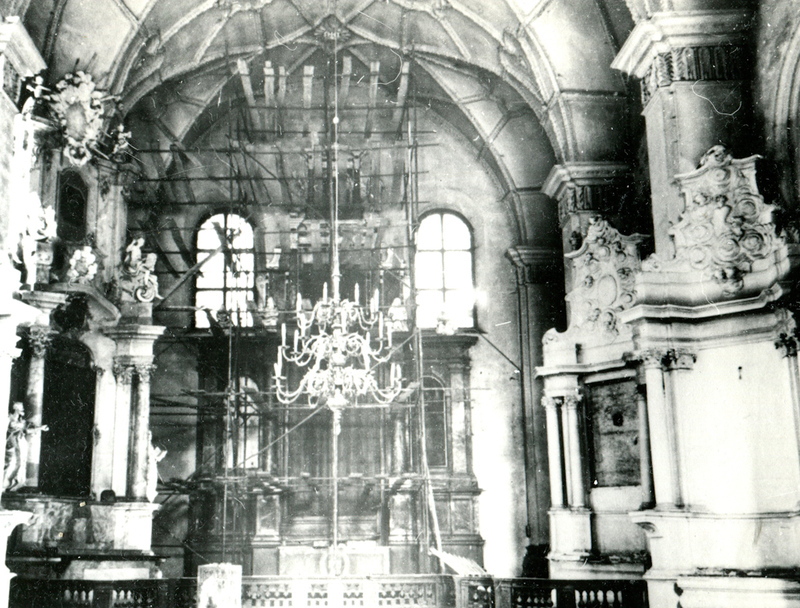 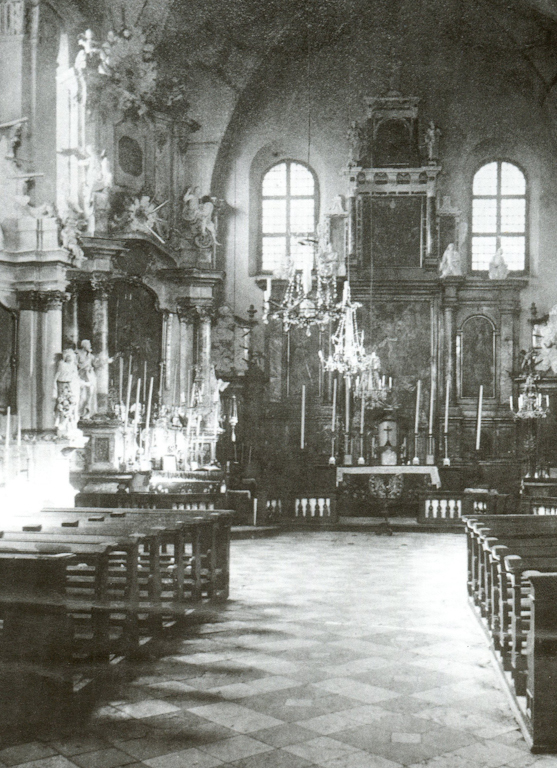 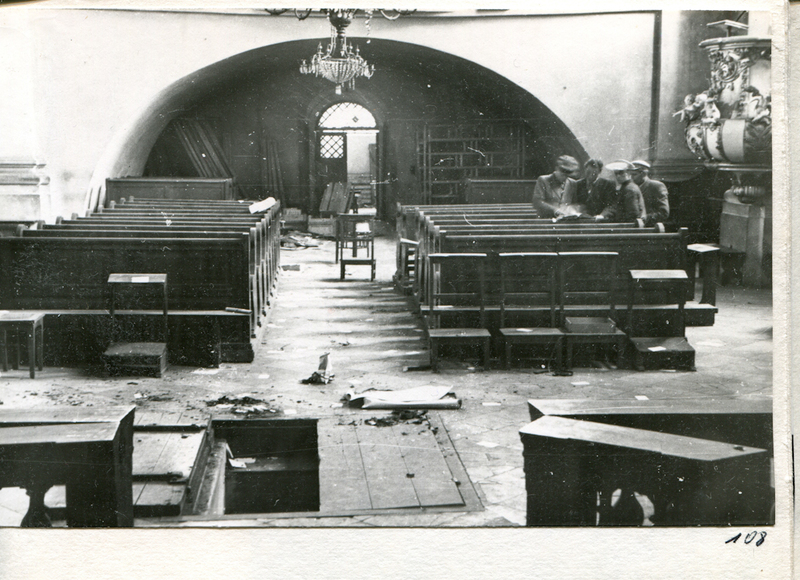 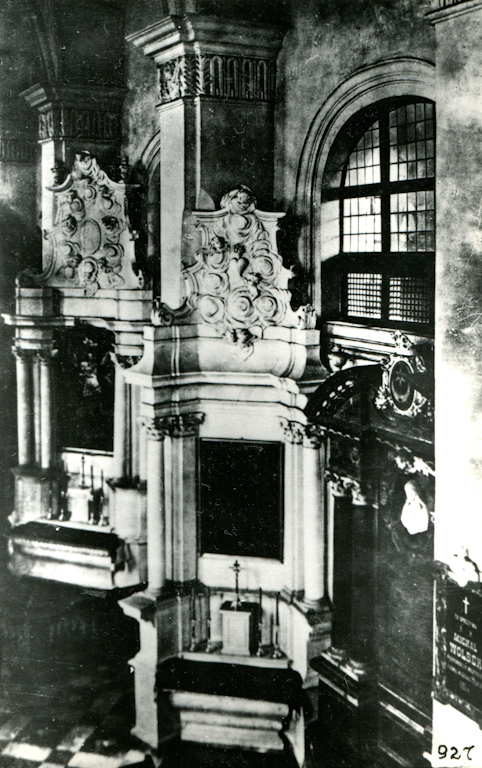 Side altars and the pulpit of the church were demolished during the Soviet era. 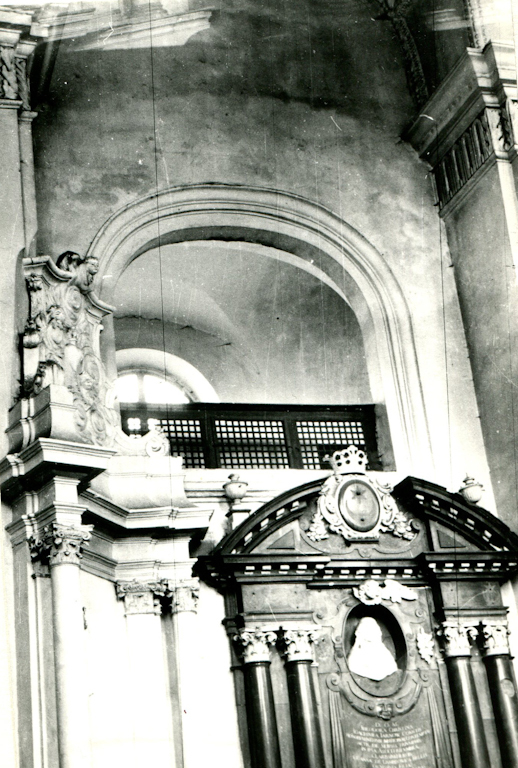 Two altars decorated the northern wall of the church: one dedicated to the Holy Virgin Mary and one to Saint Clare. 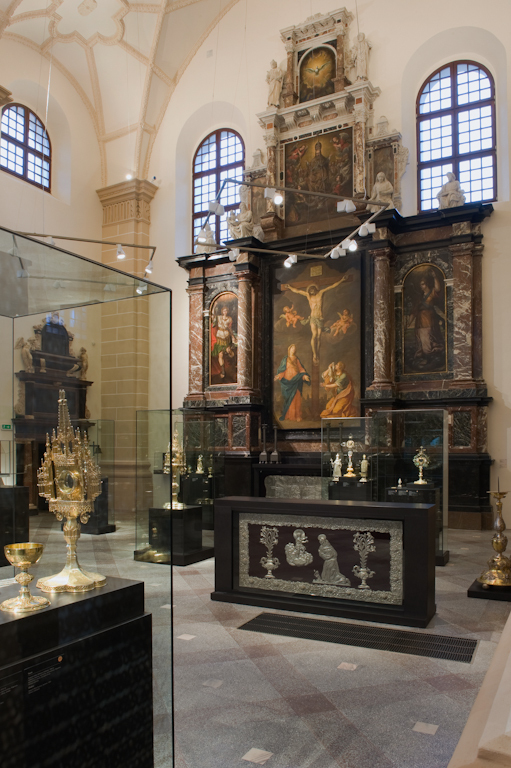 In 1629, the church received the painting of the Madonna with a Baby which had already become famous for its miracles. 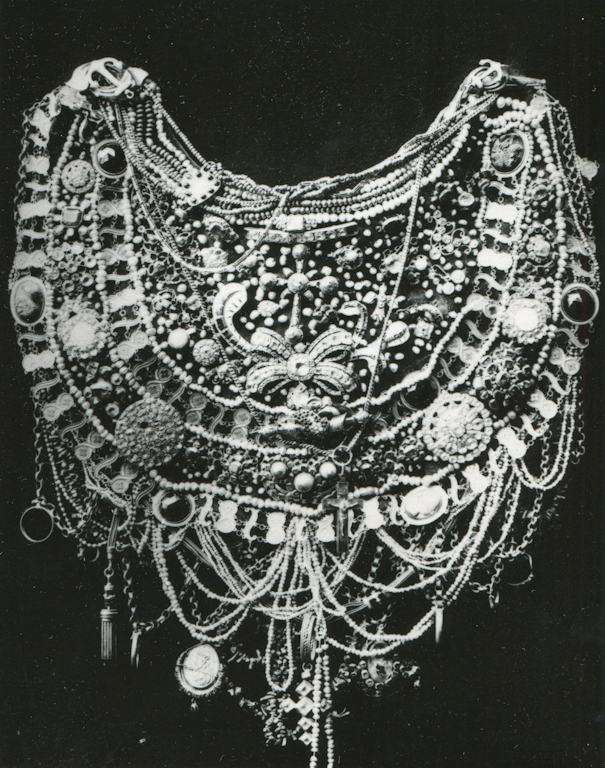 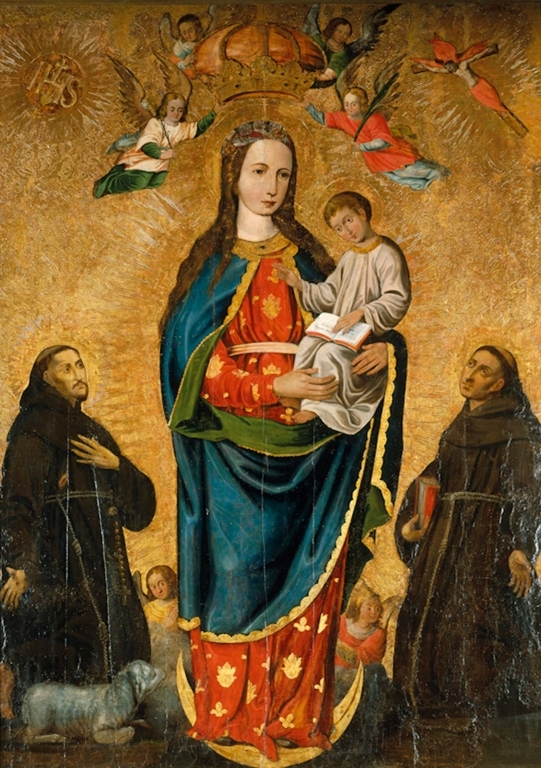 The Madonna of the Sapiehas was kept on a separate altar and was furnished with a precious riza of gilded silver and gold crowns decorated with gemstones, and lavishly awarded by believers with boons. 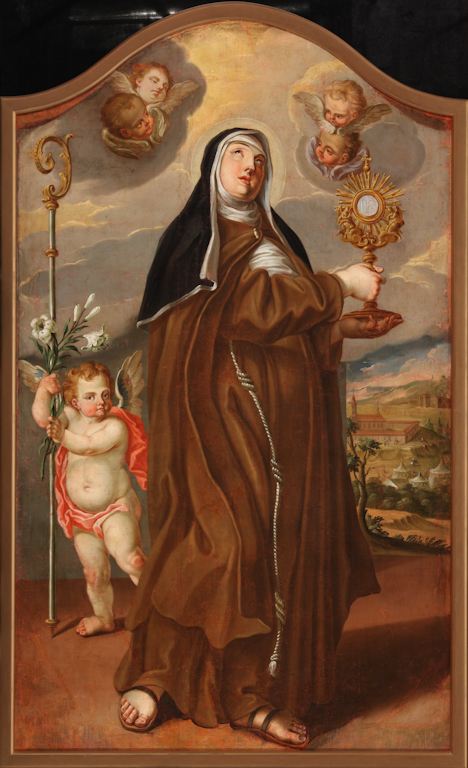 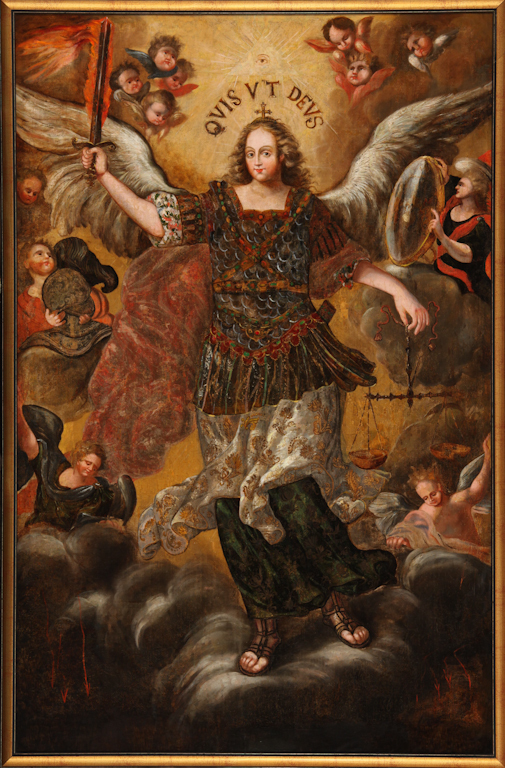 In 1691, the prioress Antanina Žabaitė founded the Brotherhood of Saint Michael the Archangel, and a new altar dedicated to the brotherhood was built, a banner was sewn and another painting of Saint Michael the Archangel was acquired. 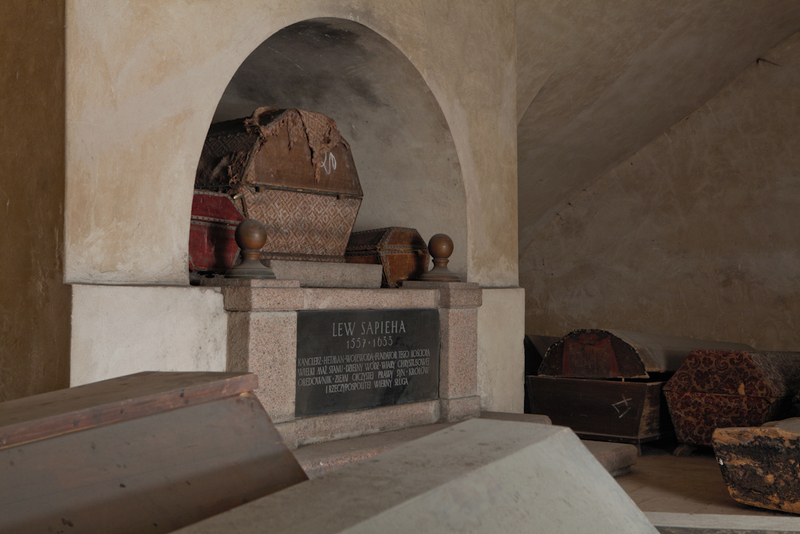 Four tombstones of the Sapieha family have survived from the 1st half of the 17th century testifying the power, wealth and subtle artistic taste of the commissioners. 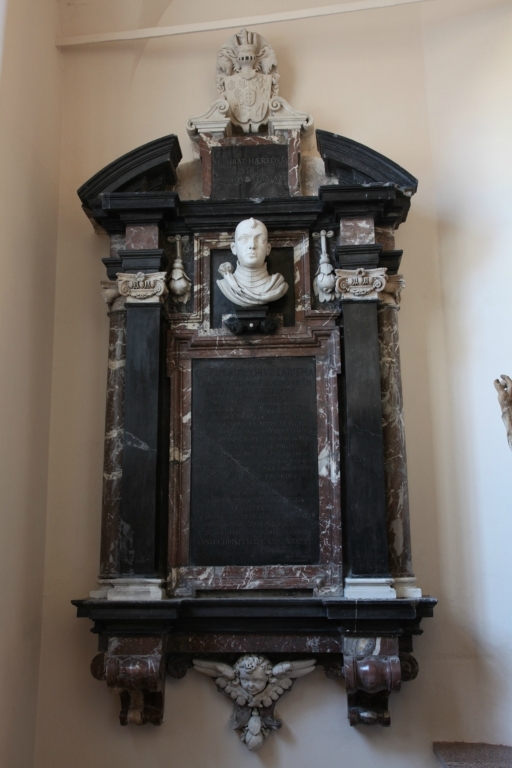 The tombstone of Leon Sapieha and his wives Dorota Firlej and Elzbieta Radziwill, the biggest and the only surviving marble Renaissance tombstone in Lithuania, is notable for its striking scale and decorations. 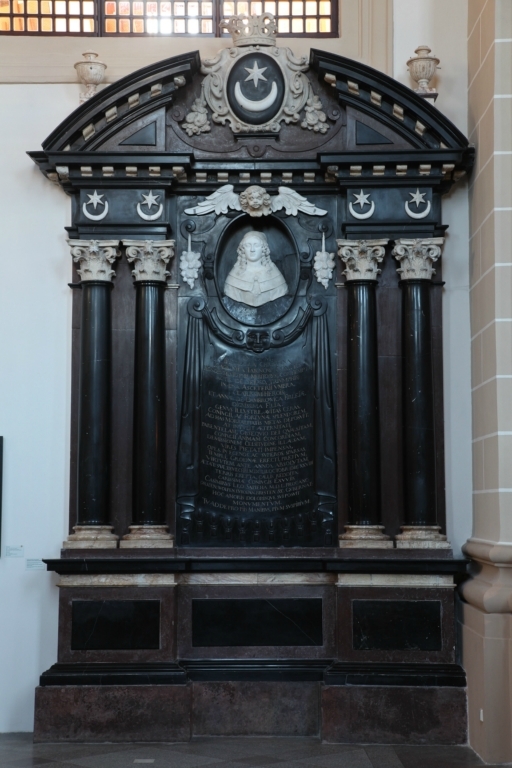 The monument to Teodora Krystyna, the wife of Kazimierz Leon Sapieha, can be distinguished for its luxury and elegance. 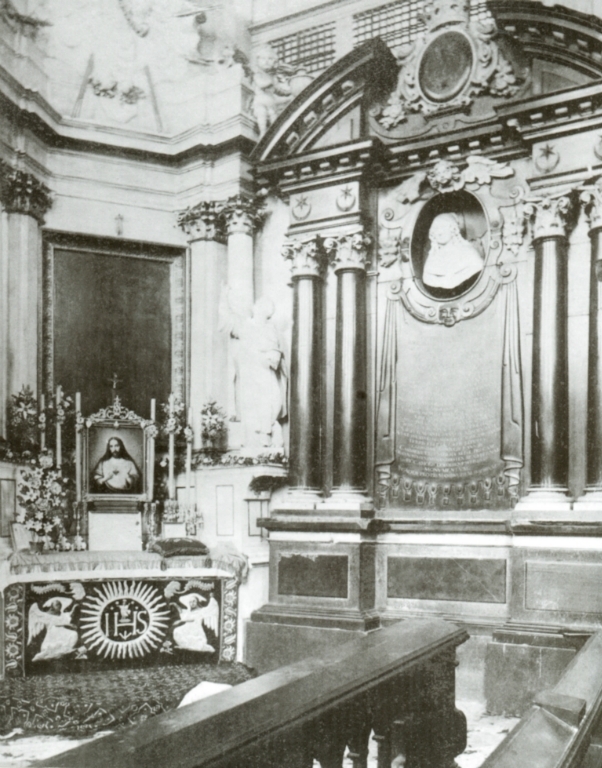 The epitaph for Krzysztof Mikolaj Sapieha created by Constantino or Giacomo Tencalla features pure style and elegant, skilful composition. 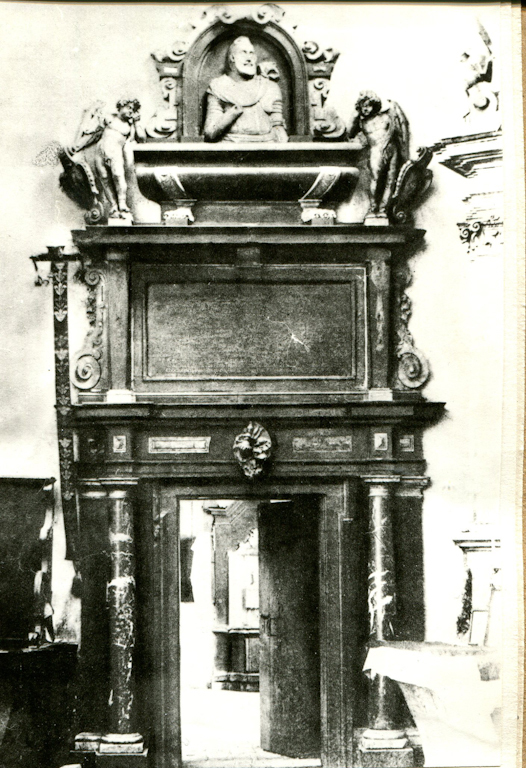 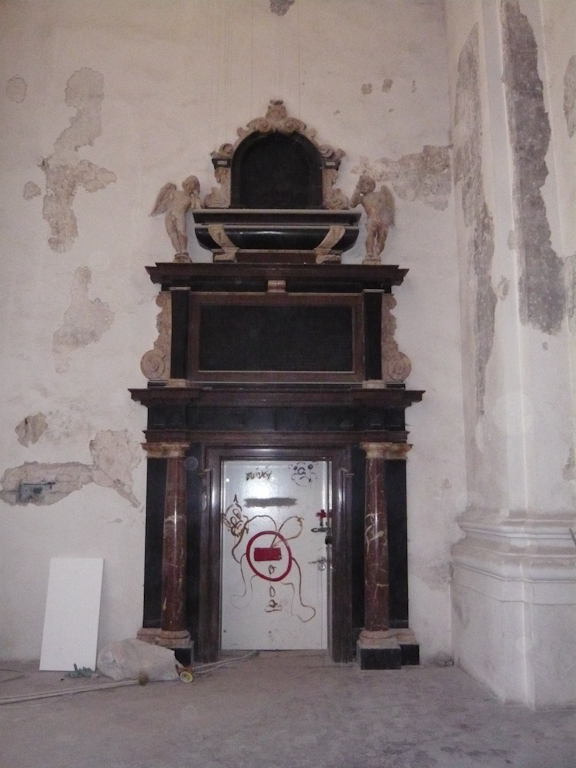 The tombstone monument to Jan Stanislaw Sapieha (1588-1635) has a unique structure - it is integrated into the portal of the vestry door. 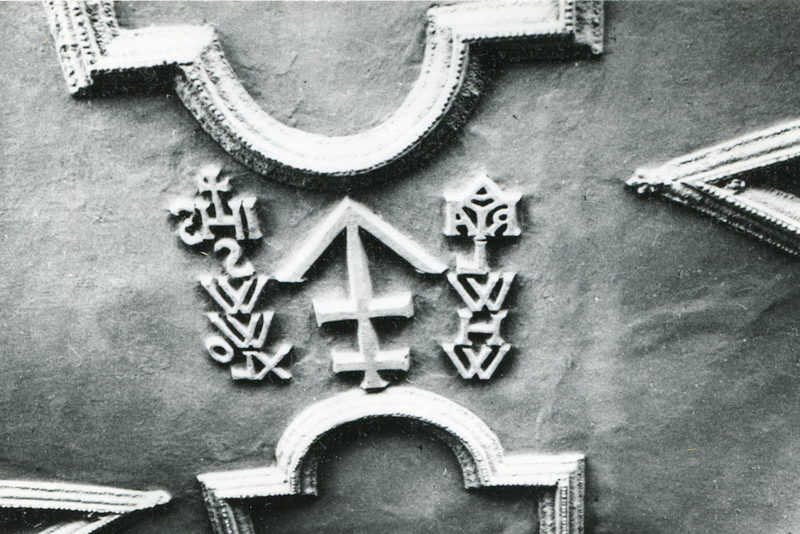 The portal composition was meant to symbolise the transition from the world of the living to the world beyond, from the temporary life to the eternal life. 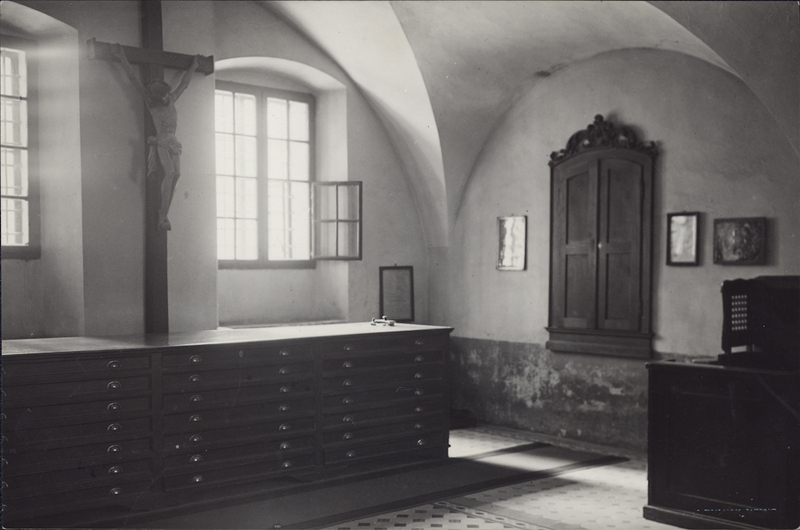 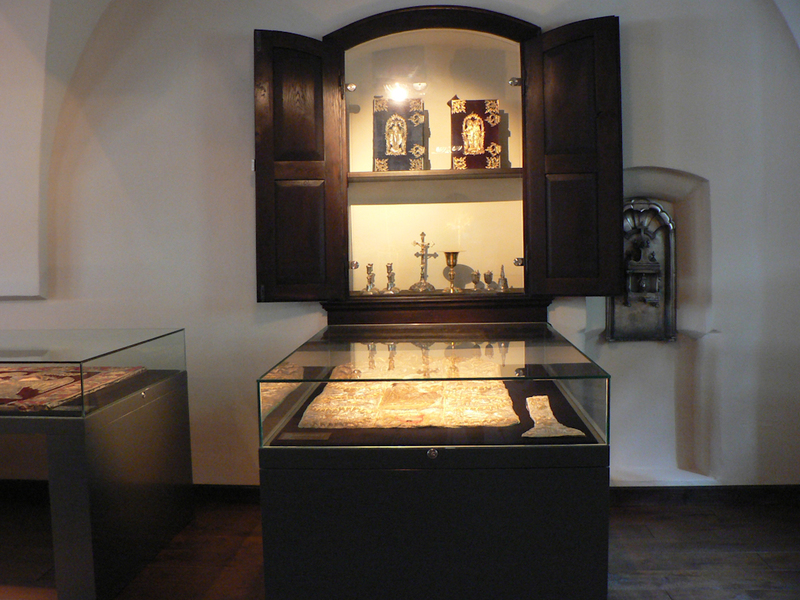 The vestry is a room attached to the church in which the clergy don vestments and where liturgical implements and records are kept. 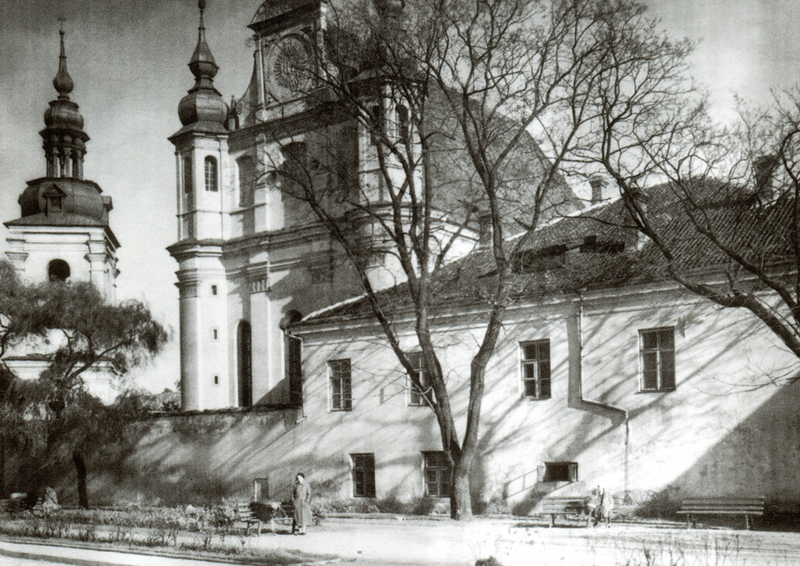 The convent church had an additional important function serving as the mausoleum of the Sapieha family. 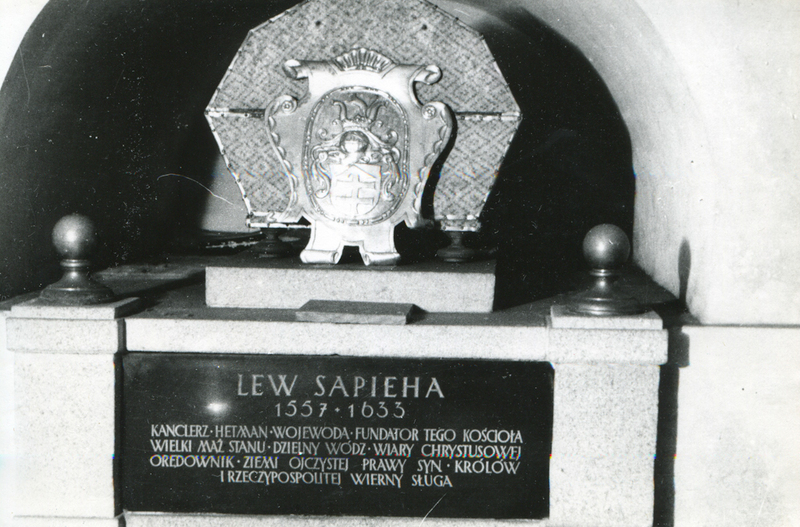 When the founder of the church Leon Sapieha died, his remains were laid in a tin coffin decorated with silver and coats of arms, and lowered into a special vault under the high altar. 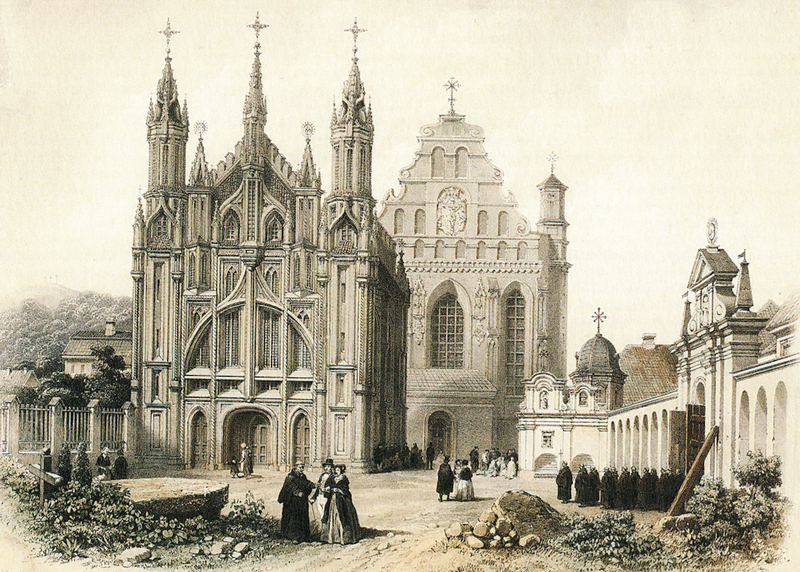 When the invading army of the Russian Empire took Vilnius in 1655, the city was sacked, burnt and looted, while thousands of residents were killed. 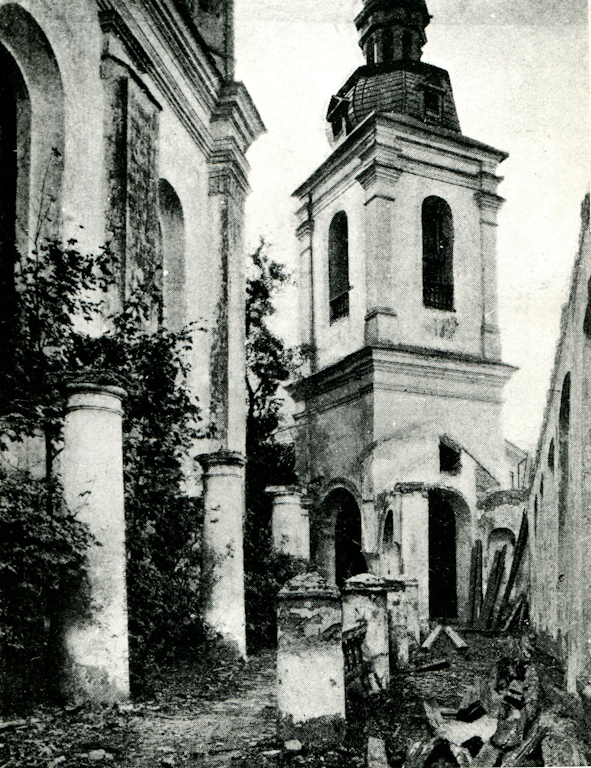 Cossacks murdered the townsmen hidden in the convent, tortured two nuns who stayed with the prioress Darata Siedleszczinska, and looted the church and the sepulcher of the Sapiehas. 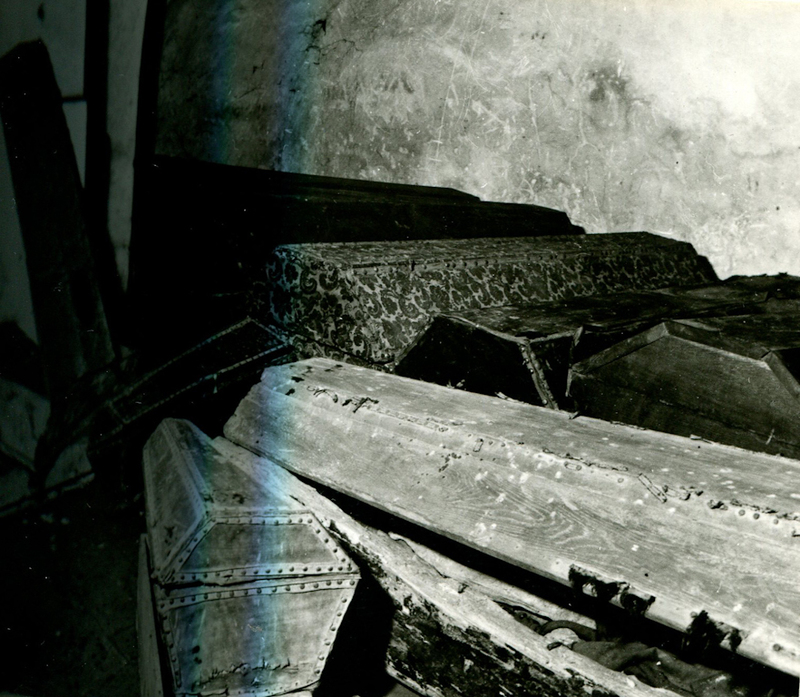 The valuable coffins and grave goods were stolen, while the bodies were left on the street. 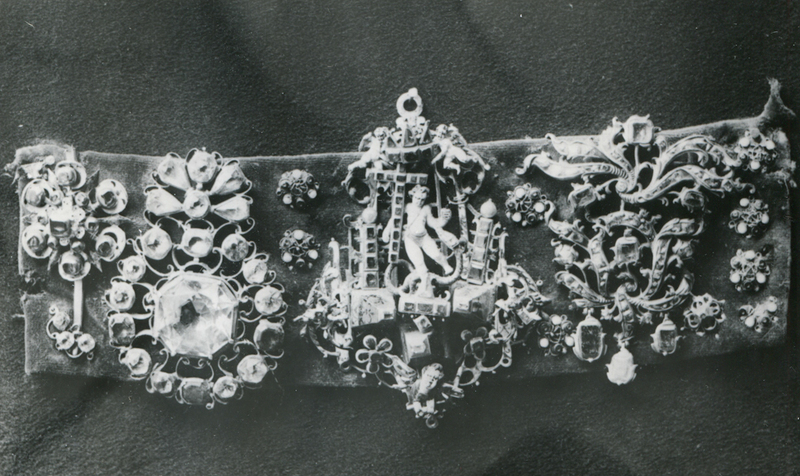 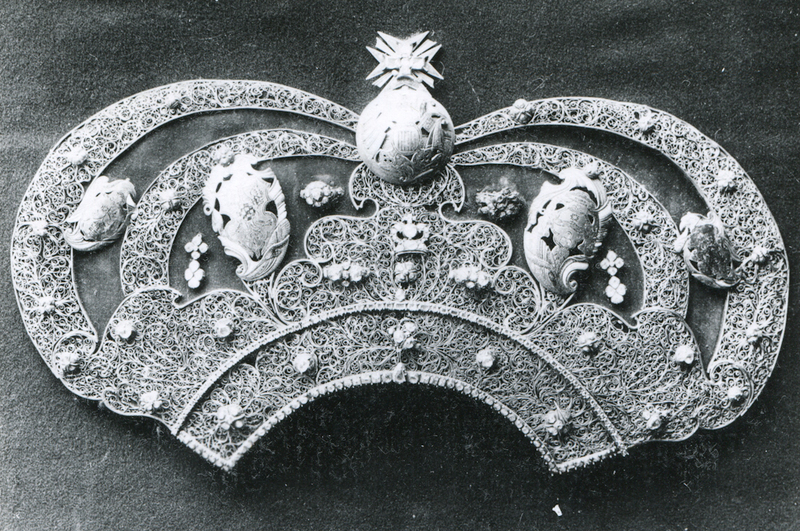 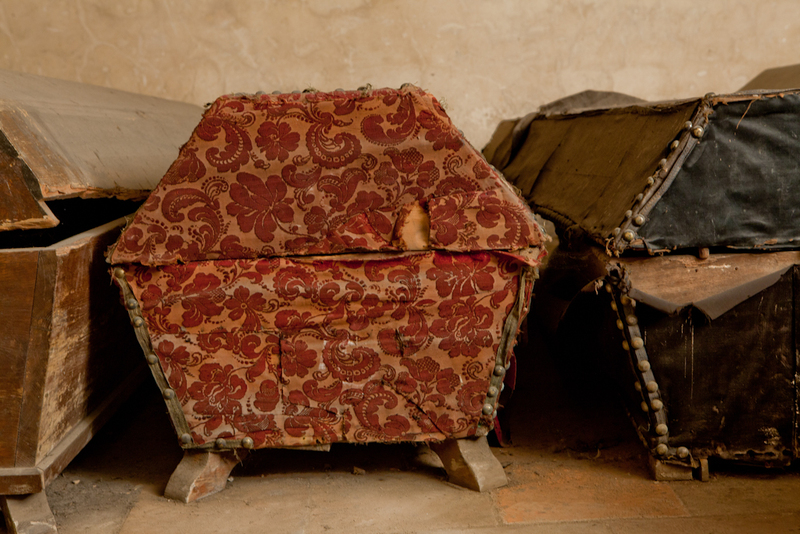 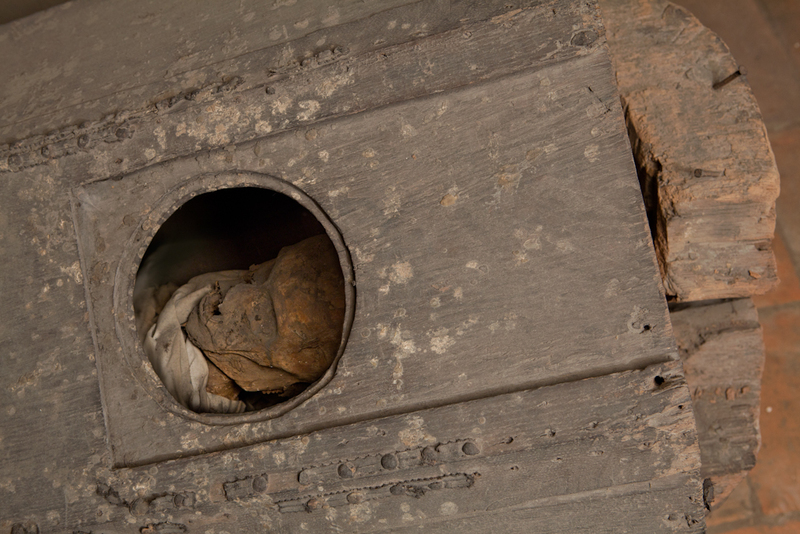 Descriptions of the 17th century suggest that the coffins of the Sapiehas buried in the sepulcher were precious, made from tin or even silver, and artistically decorated with velvet, silver and gold. 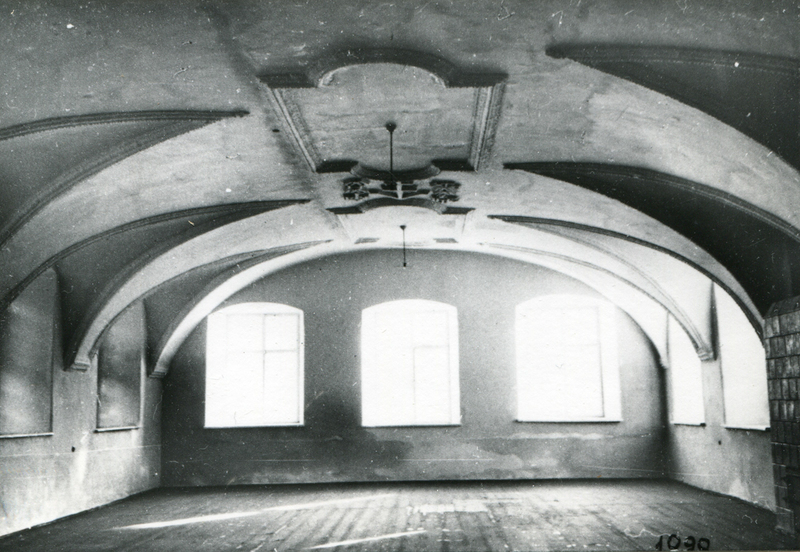 In the southern corner of the east wing, there was the refectory, the dining room of the convent, which was the biggest and the most ornate room of the convent with the ceiling decorated with the coat of arms of the Sapiehas. 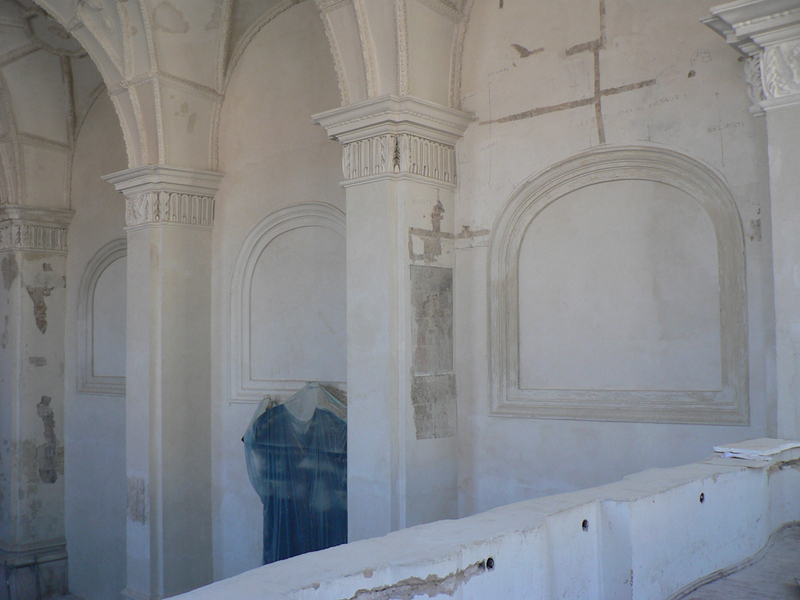 An opening in the wall of the refectory gave access to the kitchen and the pantry located around the corner in the southern wing.